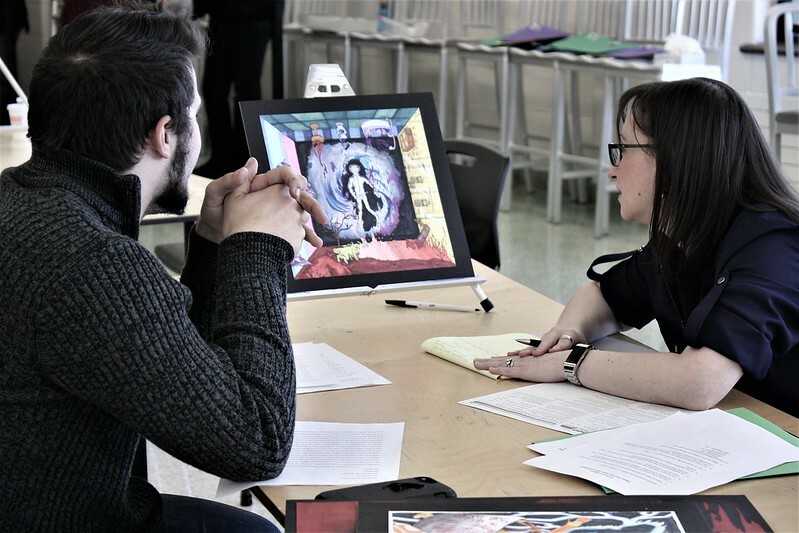 Recently, 90 William Floyd art students in grades five through 12 received the highest rating of “Distinguished” on their art portfolios at the annual New York State Art Teachers Association Portfolio Day held for the first time at William Floyd High School. In order to qualify for this award, students must be nominated by their teachers and then present their work before a professional artist for assessment. Members of the William Floyd High School National Art Honor Society assisted in the event by helping check-in participants, hand out certificates and direct visitors. Art teachers Linda Francis (William Floyd Elementary School), Marco Antenucci (William Paca Middle School), Jillian Berner (William Paca Middle School), Stephanie Taisler (William Floyd Middle School), Tim Kosta (William Floyd Middle School), Erin Almeida (William Floyd High School), Theresa Bianco (William Floyd High School), Tina Eccleston (WFHS, John S. Hobart, Moriches and William Floyd Elementary), Erika Licausi (William Floyd High School) and Sue Plunket (William Floyd High School) all had students who were adjudicated. Congratulations to the students and their teachers! Scroll through the album below to see more photos!